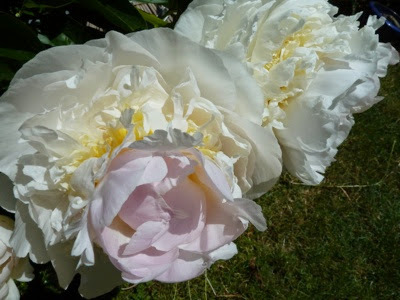 My Home and Garden: My peony and the parent plant....? 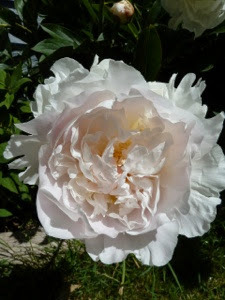 Here is a picture of this very old peony. I came by it about 25 years ago...I won't say how...it just came into bloom. Here is a picture of the parent plant, located in my neighbours yard. Mine seems somewhat double, but nothing like this !! This just doesn't make any sense to me at all. It may not make sense....but aren't they just GORGEOUS!! They really are pretty aren't they Jane. You should smell them!! I eventually figured it out. There were two peonies in my neighbours yard. I assumed they were the same rootstock. I had a piece of each. I dug up and disposed of the RIGHT peony a couple years ago. This one, the wrong one, was prone to a weird black spot and the flowers were never quite right. I thought it was because it was more shaded. Nope. Different plant. Duh.